THIS LISTING IS FOR A SIZE SMALL (6-8) CHILD COSTUME. PLEASE MAKE SURE YOU'RE PURCHASING THE CORRECT SIZE. "Police Stop" Your child will be catching bad guys before you know it in the classic child Police Officer costume. Not only will he be an enforcer at the Halloween Party but also the hero every child wants to be. This costume is great for any Halloween or dress up party. 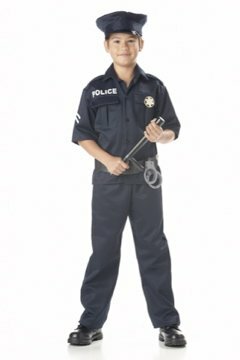 Our Child Police Boys costume features a blue polyester/cotton short sleeve shirt with two breast pockets and police screen print, matching blue polyester/cotton pants with an elastic waist, stretch police hat, adjustable black belt with gold buckle, police badge, and plastic handcuffs. The police club and shoes are not included.